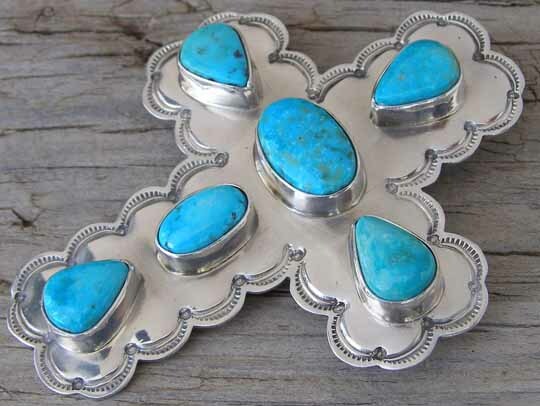 This scalloped-edge pendant by Navajo silversmith Jerry Platero is set with a combination of ovals and teardrops of natural, untreated Candelaria turquoise from Nevada. The silver cross and bezels are polished to a lustrous finish, while the decorative stampwork which highlights the scalloped edges was oxidized. This cross pendant has a shepherd's hook on back to string it on a chain or on silver beads. Stamped Sterling on back. Jerry did not hallmark this with his name. We certify that this was made by Navajo silversmith Jerry N. Platero. Stones: center oval 5/8" x 7/16" & 1 oval 1/2" x 5/16"; 4 teardrops 1/2" x 3/8"
Width of arms of cross: 7/8"
Dimensions: 3" x 2 3/8"